Chop scallionsScallions should be roughly the same size, about ½-inch or smaller. Mince garlicGarlic should be as small as possible, in very fine pieces (about &frac18; in). Shred cabbageTear the leaves apart into strands of about ¼-inch. Quarter limesLimes should be cut into four equal-size wedges. Boil water. You’ll need it for the noodles. Put noodles in a large bowl and add boiling water to cover. Let sit until noodles are just tender; check every 5 minutes or so to make sure they do not get too soft. Drain, drizzle with one tablespoon peanut oil to keep from sticking and set aside. Meanwhile, put tamarind paste, fish sauce, honey and vinegar in a small saucepan over medium-low heat and bring just to a simmer. Stir in red pepper flakes and set aside. Put remaining 3 tablespoons oil in a large skillet over medium-high heat; when oil shimmers, add scallions and garlic and cook for about a minute. Add eggs to pan; once they begin to set, scramble them until just done. 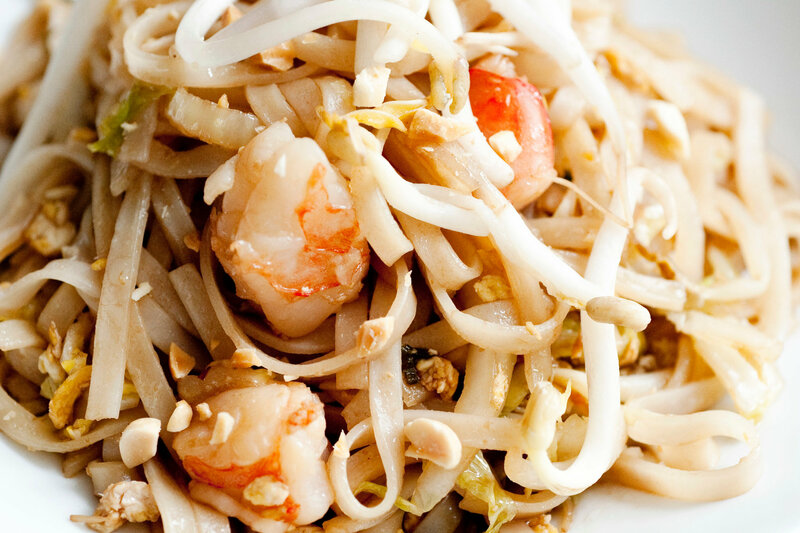 Add cabbage and bean sprouts and continue to cook until cabbage begins to wilt, then add shrimp or tofu (or both). When shrimp begin to turn pink and tofu begins to brown, add drained noodles to pan along with sauce. Toss everything together to coat with tamarind sauce and combine well. When noodles are warmed through, serve, sprinkling each dish with peanuts and garnishing with cilantro and lime wedges.